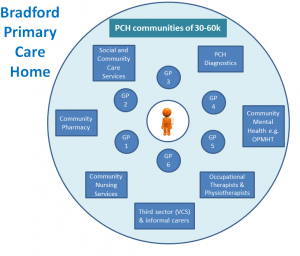 Primary Care Home Communities are a national model of delivery Primary Care through local decision-making and partnership working, focussed on populations of between 30,000 and 60,000 people. In Bradford and AWC, these are now called Community Partnerships, with 10 Community Partnerships in Bradford (CPs 1-10), centred around small groups of GP Practices, and 3 in AWC (Airedale, Wharfedale and Craven). These cover approximate geographical areas. Within these Communities, a range of different agencies will work in partnership to deliver Primary Care Services to their local population. These will include the local Voluntary Sector. These are each co-ordinated by a Leadership Team, which comprises representatives from different agencies, including a GP, a GP Practice Manager, Community Matron, Community Pharmacist, Care Home/Domiciliary Care Provider, and a VCS Representative and Deputy. 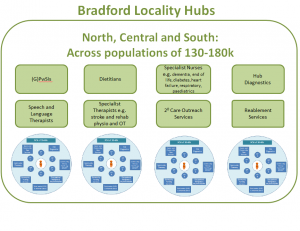 Across Bradford, these CP Communities are groups into 3 Localities: North, Central and South. In these Localities, some more specialist services will be delivered across a wider geographical area. These include Dietitians, a variety of therapies, and Specialist Nurses. Other services such as Acute and Urgent Care, Social Services and Children’s Services will continue to be delivered on a Bradford-wide basis. Further information about the CP model in Bradford can be found in this document. This document shows which GP Practices are in which Community Partnership. These maps highlight the locations of different GP Practices, and which Community Partnership they’re part of. The organisation must have an anchor in a particular locality in the Bradford District, and be recognised as being key to that locality. The organisation must be able and experienced in multiple service delivery. The organisation must be able to demonstrate it supports smaller local organisations and groups in its locality, and have a sound understanding of the communities and issues in their locality. The organisation must be financially independent, including earned income and/or long-term contracts. A number of organisations put themselves forward as meeting these principles, and these were confirmed by the BVCSA Directors. These ‘Community Anchors’ were then allocated to their nearest CP Leadership Team, and will take the lead VCS Representative role on the CP Leadership Team. They will be assisted by a Deputy. Deputies will be determined in due course, either from a key local Provider who is able to provide specialist input into particular local priorities, or to reflect different geographical areas covered by a CP. Both the Lead and the Deputy roles are carried out on a voluntary basis. The current list of VCS Representatives can be found here. All VCS Representatives will fulfil the following agreed Roles and Responsibilities. 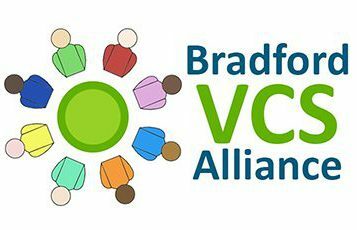 Each Community Anchor will be developing local networks of VCS organisations to support this work, and Bradford VCS Alliance will be aiming to deliver some projects into local areas through these Community Anchors.